Tighten the set screw to bite into an unhardened shaft for a secure hold. The two-piece design allows you to install these collars anywhere on a shaft without removing components or having access to the ends of the shaft. Clamping screws provide extra grip. 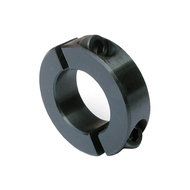 Collars are black-oxide steel, which offers some corrosion resistance.